The Guinness Book World Record for height over a bar stands at 11 feet 1 inch. Let’s just think about that for a second and put it into perspective. Things that you can jump over at eleven feet: a basketball hoop, an elephant, a really big truck, even Jason’s mom when she’s lying down…maybe. The world record is currently held by Dmitry Arsenyev. 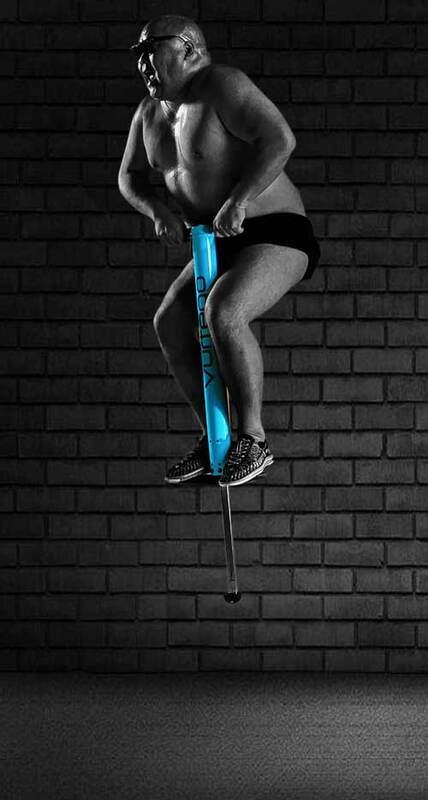 Three other Vurtego Pogo Stick team riders are chasing Dmitry’s record. Biff Hutchison has cleared 11 feet 0.5 inches, and two others cleared 10’6″ – Nic Patino (featured here), and Dalton Smith. When we set out to make the world’s best extreme pogo stick all those years ago, we never imagined we’d come this far. 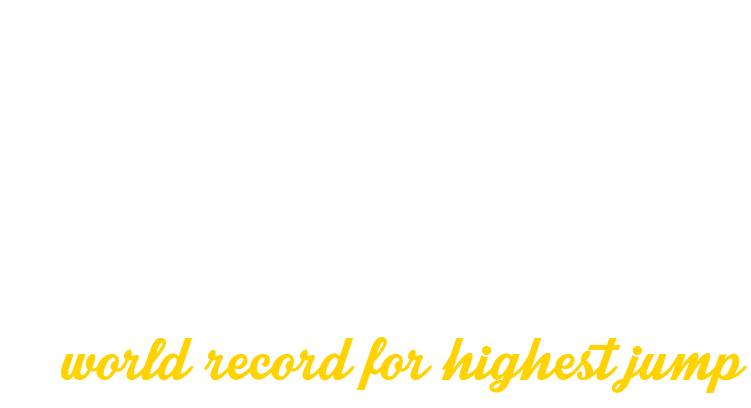 Sure, we thought people would one day jump six or seven feet…but over 10 feet??? HECK NO!!! We’re constantly tinkering and playing around with new ways to improve the function and design of our sticks. For years we worked on going higher and higher. Double digits was our overarching goal. We’ve finally achieved that mile marker, and in the process we stumbled on a way to make the ride smoother in the process, which has been more important than the new crazy heights. The increased air volume in the V4 makes the bounce feel far more like a trampoline than ever before. It’s a softer, yet more powerful bounce that allows you to determine your own personal use, whether it’s jumping one foot high or flying over cars and down massive sets of stairs. When we set out to create the world’s best pogo stick that could jump more than a few feet in the air, we realized that a traditional metal spring wasn’t up for the job. We tried, and we ended up with a massive spring pogo stick that weighed in at a hefty 40 lbs. After a lot of hard work, we figured out how to use an air spring with far more efficiency than a metal spring. Even in our first air pogo stick prototypes it was an unbelievable difference, but after years and years of experimentation we’ve reach new new heights. 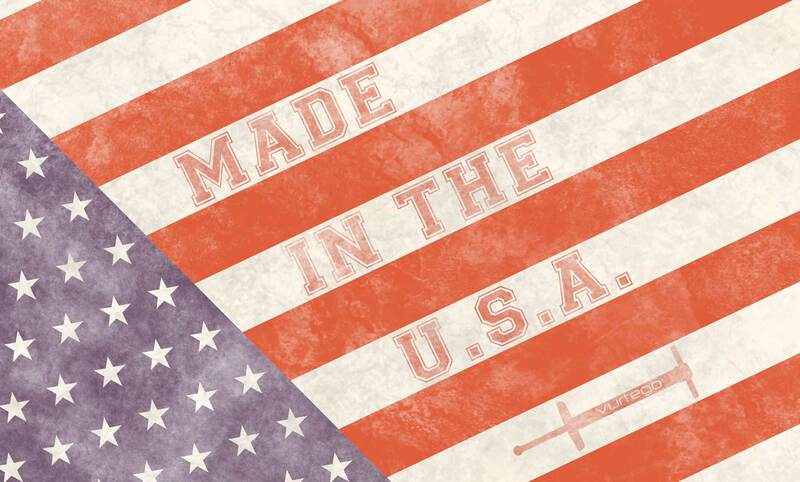 Our patented air spring is far more powerful than a traditional spring and weighs…well, like zero pounds. Oh, and our air spring can also be fine-tuned to your exact preference, which can’t be accomplished with traditional springs. Want a soft spring that limits you to a couple feet of air? Pump the stick up to a low air pressure somewhere around 1/4 of your body weight in pounds. Want to jump higher? Pump some more air into it. It’s as simple as that! 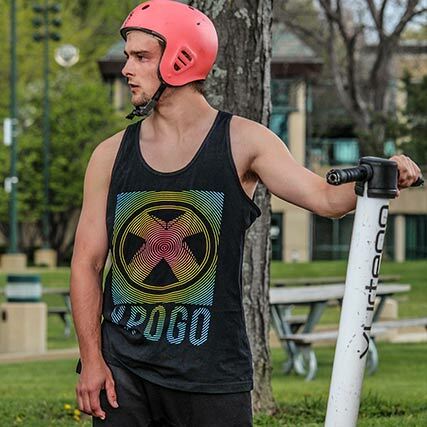 The V4 Pogo Stick holds 2,844 cc of total air volume to create our air spring. That’s enough to create a crazy smooth, totally soft bounce that gives you the potential to jump just about as high as you could possibly imagine. The design of the pogo stick itself is actually really simple. The inside of the pogo stick is an empty chamber, at the bottom of which is the V4 Air Piston. When you land on the ground, the piston gets pushed up into the cylinder, compressing the air within. Air doesn’t like being compressed; like…at all. When air gets squeezed into a small space the molecules get all excited and bang into each other, forcing the air to expand. When the air expands it pushes the piston back down to the bottom of the cylinder, which causes you to go flying into the air. The design is almost exactly how a regular metal spring works, but the execution of it is very tricky. We have to manufacture our pogo sticks with extreme precision to ensure that they hold air properly. Our original goal was to create the feel of a trampoline. It’s taken quite a while, but we’ve finally nailed it with the V4. The result is a softer and more controllable feel than ever before, giving you the ability to do anything you want, whether that’s jumping over cars or just a couple inches off the ground. You only want to jump a foot or two off the ground? Not a problem. A little bit of air creates a nice, soft spring. The low air pressure will soften the spring for a carefree bounce that won’t go more than a couple feet off the ground. Having full control over your bounce and being able to create ‘a line’ is when the real magic happens. There’s a feeling of joy as you bounce from spot to spot, weightless at the top of each jump, spotting where you want to land on the next bounce and then hitting that exact spot, ready to fly back into the air for the next jump. It’s an amazing feeling. Like a swish from three point land or stomping the landing on a snowboard. It’s a feeling of supreme control. A weird sky dance, hopping erratically from one place to another. You can bounce almost anywhere. On almost everything. It’s like having the world covered in trampolines. If you’re looking for that cushy trampoline bounce, fill the pogo stick to about 1/4 of your body weight in psi (half your bodyweight in kg). The low air pressure will soften the spring for a carefree bounce that won’t go more than a couple feet off the ground. The V4 is great for cardio, and it’s easy on your body. Compared to the impact from running, the smooth transition of jumping up and down on our pogo sticks minimizes joint stress and hits the entire body. It was a classic blunder on our part. In our effort to create a new extreme sport and make something that only crazy would want, we completely missed done missed out. Fitness. The V4 is great for cardio, and it’s easy on your body. Once you’ve mastered the basics skills of jumping around at 1/4 of your bodyweight, you can boost the air pressure up to 1/3 of your bodyweight. This will tighten the spring and provide more resistance. Compared to the impact from running, the smooth transition of jumping up and down on our pogo sticks minimizes joint stress and hits the entire body. While your legs take on the heavy lifting of jumping over and over again, your core will contract and tighten to maintain balance.. You can choose your own intensity level, but no matter what your heart rate will kick into high gear in just a couple minutes. When we say you can do just about anything on the V4 that you can do on a trampoline, we mean really do mean it! For us, the V4 is all about that split second of lapse in gravity at the top of a really high jump. Let’s face it, you’re probably looking at this picture and foaming at the mouth with the thought of pushing the limits of gravity…either that or your palms are all sweaty just thinking about it. When we say you can do just about anything on the V4 that you can do on a trampoline, we mean really do mean it! You know that feeling of weightlessness right at the apex of a jump and then the rapid acceleration of free fall back to the ground? We do. We love it. We crave it. For us, the V4 is all about that split second of lapse in gravity. Let’s get one thing clear, though. As much as you dream of jumping over cars and off of roofs, you won’t just be able to go out and jump high right from the start. Jumping more than a few feet on a trampoline doesn’t take much practice because you only have to deal with your own body, and you walk around with your own body all the time. Add a pogo stick to the equation, and the feeling changes. Before jumping high you’ll need to develop an understanding of timing and balance with the pogo stick. Nobody’s ever gone out and jumped high right from the start. BUT – once you master moving around and jumping a couple feet high, you’ll be ready to log some hours of flight time. Pump the pogo stick up to 1/2 your body weight. Step up onto the stick and get ready to fly! 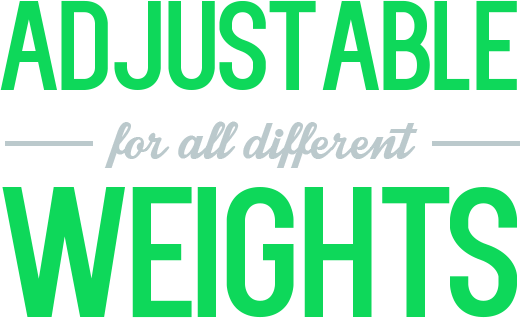 Whether you weigh 75lbs or 300lbs doesn’t matter. A youngin and a fat old dude can jump on the same exact V4 pogo stick simply by adjusting the tension of the spring. Because the V4 uses air pressure, adjusting the stiffness of the spring is as simple as adding or removing air. Kids will probably use somewhere in the 35psi range, while a really big guy might use 70psi. The more air pressure you put into our pogo sticks, the stiffer the spring becomes. If you pump too much air into it, you won’t be able to compress the spring. It’ll feel like you’re jumping on the ground. If you put too little air, it’ll be the equivalent of riding a bike with a flat tire. The spring will be saggy and won’t propel you into the air. Finding your comfort level in terms of psi only takes a few minutes, and once you figure out your preference, you’ll always pump the stick up to that pressure. Take your thoughts are of a regular ole’ pogo stick and throw them out the window. Clear your mind and allow it to start over completely from scratch. You’ve never seen or heard of a pogo stick before. No more memories of rickety spring pogo sticks that only jump a few inches off the ground and break within a month. Take a look at the picture of Dalton Smith jumping over a van on his pogo stick and allow this to ferment for a bit. We’re redefining what the word ‘pogo stick’ means with images like this. 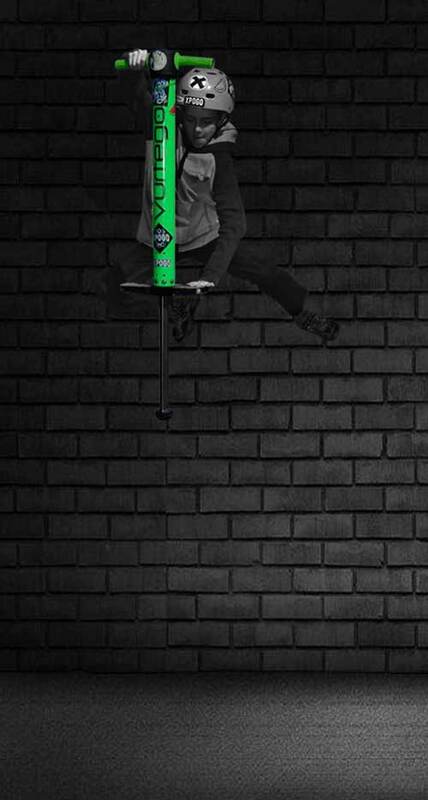 Our V4 completely changes the game and opens up new possibilities that were never possible or even thinkable on a pogo stick before. It’s still technically called a pogo stick, but comparing the V4 to a traditional pogo stick is like comparing a tricycle to a mountain bike. We’ve been at this for ten years now, and we’ve come a long way. But compared to the major extreme sports out there—like snowboarding, skateboarding, and surfing—we’re still in our infancy. The tricks that have been landed today are a drop in the bucket compared to what the future will look like. Every year that goes by brings newer, more creative and crazier tricks. It wasn’t too long ago that a stickflip won the best trick competition, and now stickflips are thrown in between even more difficult tricks just to keep a combo going. 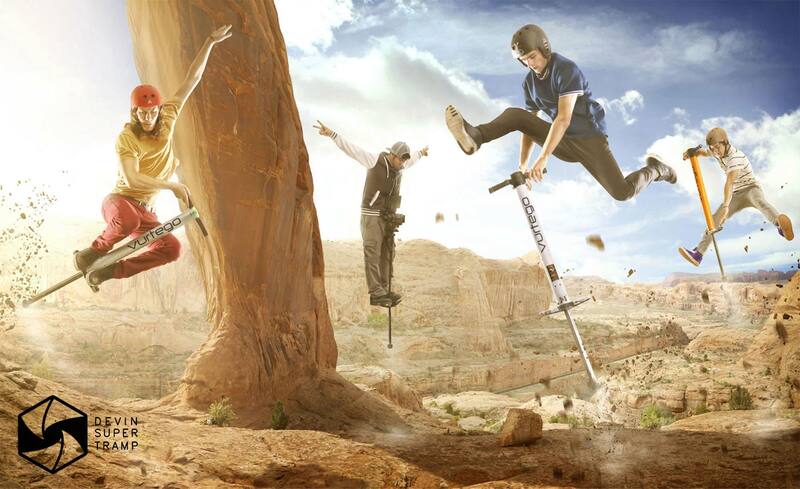 We’re constantly amazed by the things we see the Xpogo and Vurtego team riders doing. We cannot wait to see what the future holds! noun: the hypothetical fall of a body such that the only force acting upon it is that of gravity. There’s no shortage of tricks you can do on our world’s best pogo sticks, ranging from the basics like no handers and peg grabs all the way up to flips over cars and grinds down 20 stair sets. Just like any action sport, tricks are the name of the game for pogos. Pushing the limits is always exhilarating and exciting; but only if you don’t get hurt in the process. When it comes to pulling off a new trick the pros have already done the hard part: thinking of it and then going out and actually figuring out exactly how to do it. Knowing how to do a trick is half the battle of actually pulling it off. And we don’t mean just being able to see someone else do it and then trying to figure out for yourself. We’re talking about having the trick broken down into individual steps for you to follow, practice in a safe way to prevent unnecessary injuries, and also how to properly bail when you find yourself in trouble. These tutorial videos are a perfect way for you to step up your pogo game, and Xpogo has set them up in a series for you to progress through, starting at the basics and working all the way up to the toughest tricks in the game. 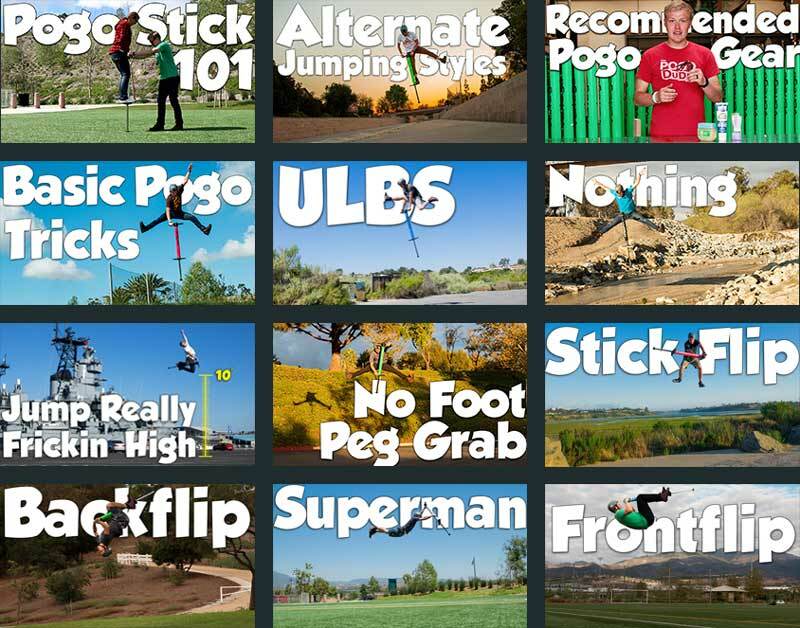 Before trying any tricks on your own, give these videos a watch and you’ll be much better off…we promise! 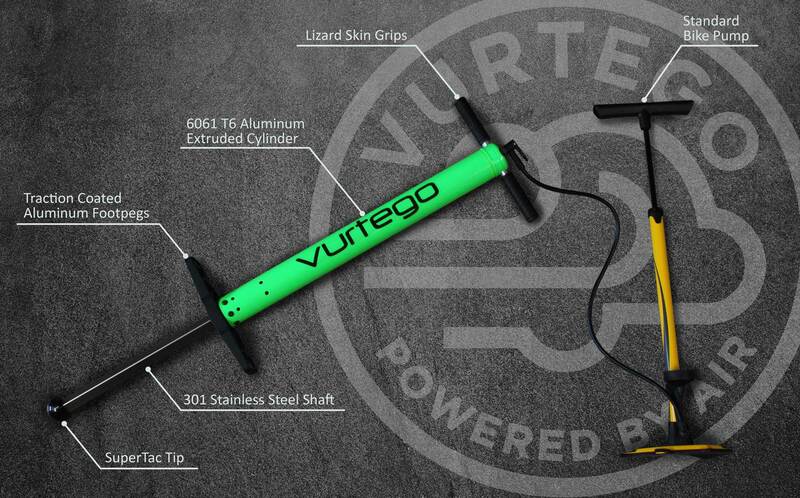 There are few times in a life that a company tries to release their very best to the public and in the case of the v4, they are allowing to purchase the world’s greatest pogo stick ever made…it’s far superior to anything else i’ve ridden. if you pogo stick, this is a necessity. Brilliant! Amazing! Fun! Great Communication! LOVE LOVE LOVE LOVE! This company is doing amazing things and this stick will be the talk of your town, it is in mine. …an intense cardio workout rivaling anything at the gym! I, a 6′ 2” 160 pound guy can jump easily 4 or 5 feet off the ground but my 70 pound brother can use it just as easily by releasing a little bit of air. This thing IS expensive but well worth it. It’s definitely more of a piece of equipment than a toy.